Happy Memorial Day Weekend. I know I earned this weekend. I'm exhausted! Before I give you the run down on some sales and fun finds I needed to share this photo with you. Do you love it as much as I do? 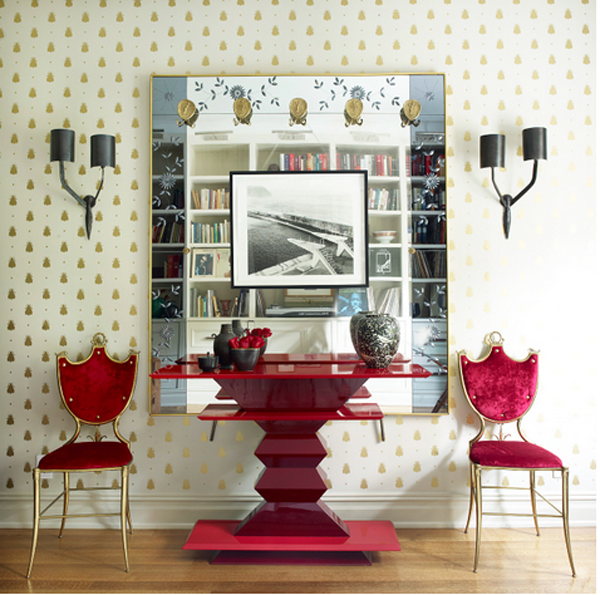 I'm so scared of ever decorating with red and this console and chairs just make me want to change that. This space is designed by Alexandra Loew. You can see the rest of the apartment here. || This was a fun article about all the things we no longer do because of technology. || Lulu and Georgia is having 25% off with code TAKE25, through the 25th. Loving this Koi tabletop collection. it's so colorful and different. || I have been eyeing this skirt for a while and it's on sale now! But they don't have my size! But maybe they have it in yours? || The favorite sandals are on sale. What? and these shoes are only $27? How is that even possible? || If you didn't know tiles in interior design are trending. This is a great article that will put you up to speed. || love the boldness and brightness of this home. Albertina I am in love with that red table!! fabulous! The picture hung in front of the mirror is very smart as well (we've all seen art hung on bookshelves! Thanks so much!! Great links! I love that idea of using mirrors to amplify the space; for a short time I lived in a space that had a wall of mirrors and I loved how it made the room look so much bigger and brighter, yet still felt cozy and snug. Have a wonderful weekend my friend! You deserve it!! All great links, thanks Albertina! Have a great weekend! wow those shoes! great find!